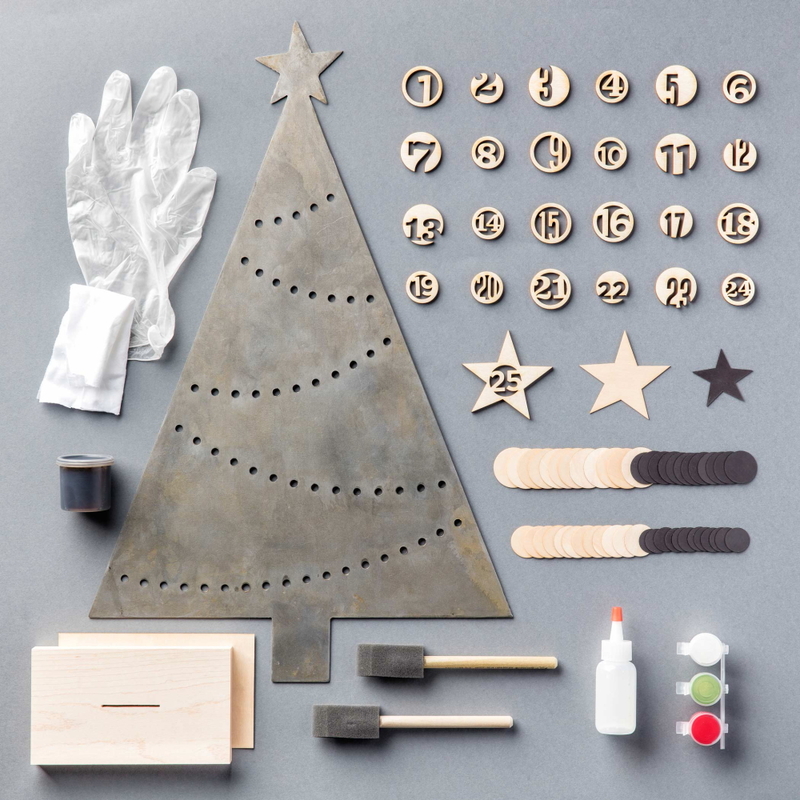 Countdown to Christmas Day with this Christmas Tree Advent Calendar that will quickly become part of your holiday traditions and decor. Christmas is my very favorite time of the year! I swear there is something in the air that makes people more friendly, and compassionate. Plus, it is a time that is filled with fun family traditions and of course, lots of yummy treats! In fact, all year long I am counting down to Christmas. What’s that? It’s August already? Only 5 more months till Christmas! Do you love Christmas too? If you said yes, I have such a fun craft kit for you! 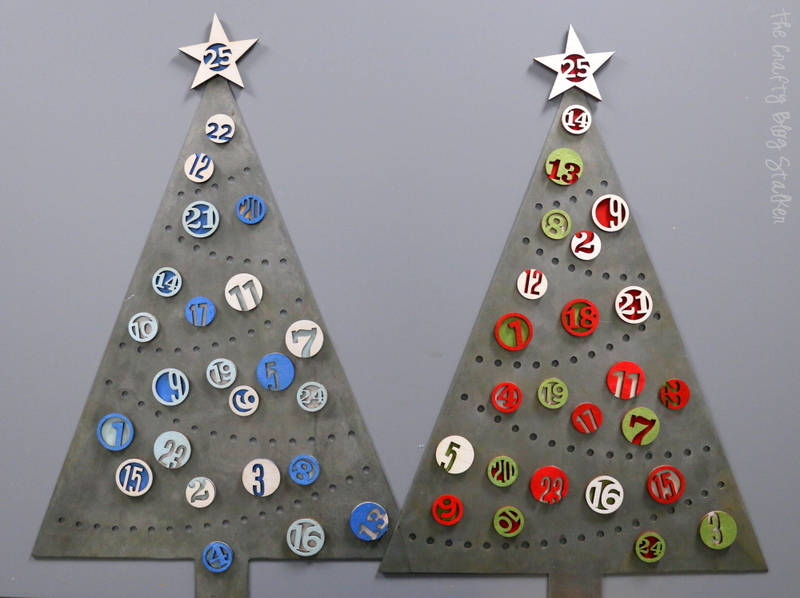 It is called Christmas Tree Countdown and is no longer available for purchase. The kit does come with everything you need to complete, but I wanted to mix things up a bit. The paint included is white, green and red. 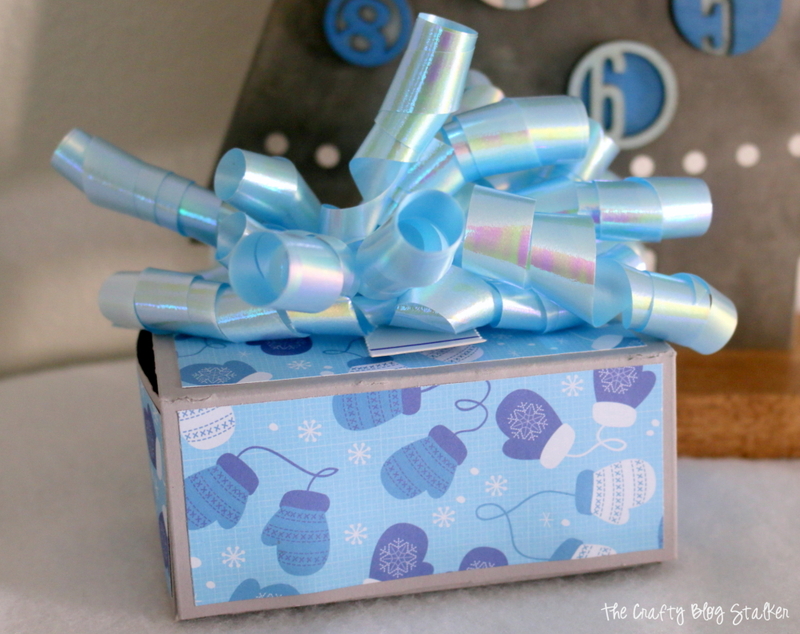 While those are the traditional Christmas colors, I generally decorate for Christmas in blues. So I purchased two blue paints to use instead of the red and green. That is why Apostrophe S kits are so great because you can make as intended or easily adjust to fit your own style. Before we begin the tutorial I also want to show you the metal tree. The tree stands 20.5 inches tall. It is a big tree and is solid steel. 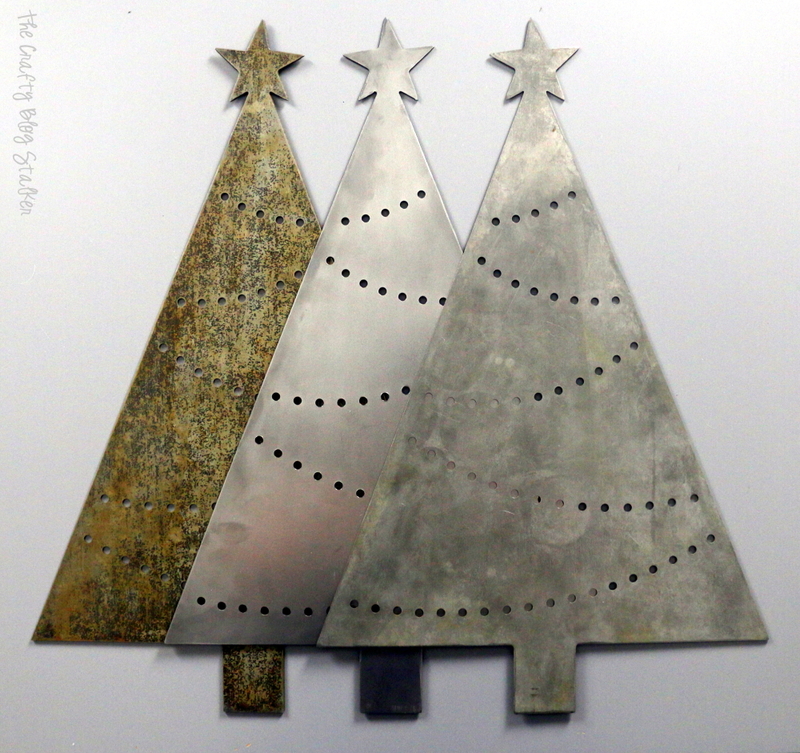 Since the tree is steel there are a couple cool finishes that you can do to it. The tree comes in the kit tarnished looking, it is the tree on the far right in the picture below. It isn’t very shiny, but has a lot of texture in the way it looks. The center tree has been polished using a metal polish and is very shiny. The tree on the left has been rusted, and this look is really cool too. I did not rust this tree. I borrowed the sample from Apsotrophe S, so I don’t have an exact recipe for you. 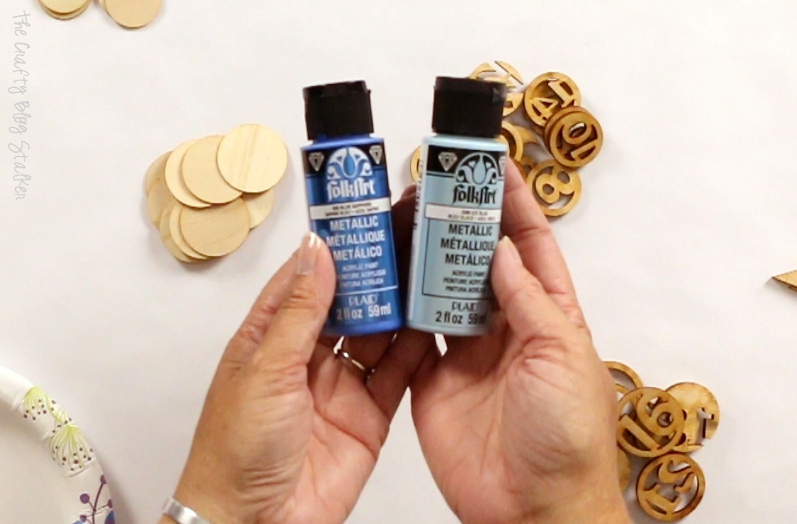 If you do a search on Pinterest for “how to rust metal” there are a lot of different solutions you can try. To begin, stain the maple wood base. The kit even includes a plastic glove and the rag needed. Apply as many coats as desired to get the color depth desired. Apply the stain in the same direction as the grain of the wood to keep the stain natural looking. 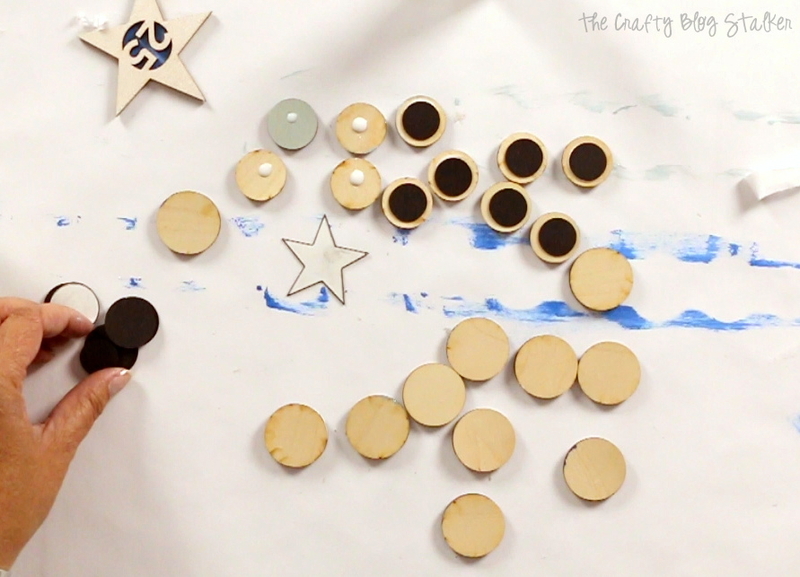 Tip – While waiting for the stain to dry, begin painting the wood ornament pieces. 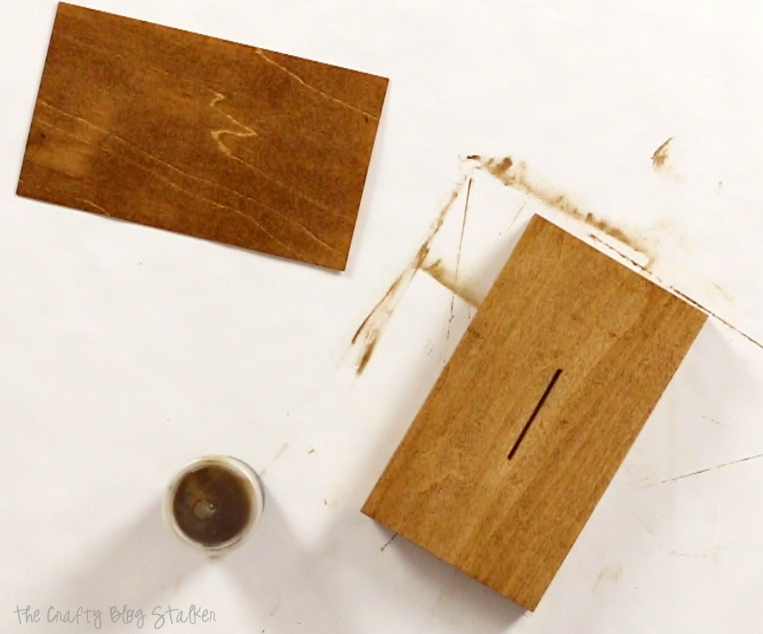 When the wood is dry, glue the two pieces together. Place a heavy book on top to help the pieces to dry securely together. 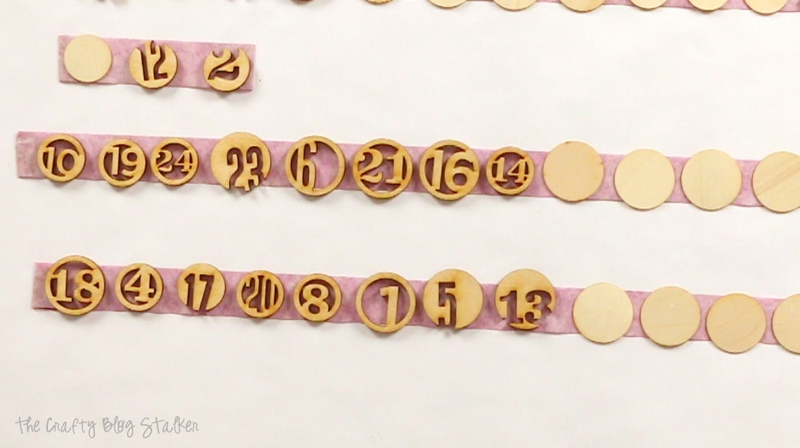 There are a lot of Laser-cut wood pieces that make up the numbered ornaments. 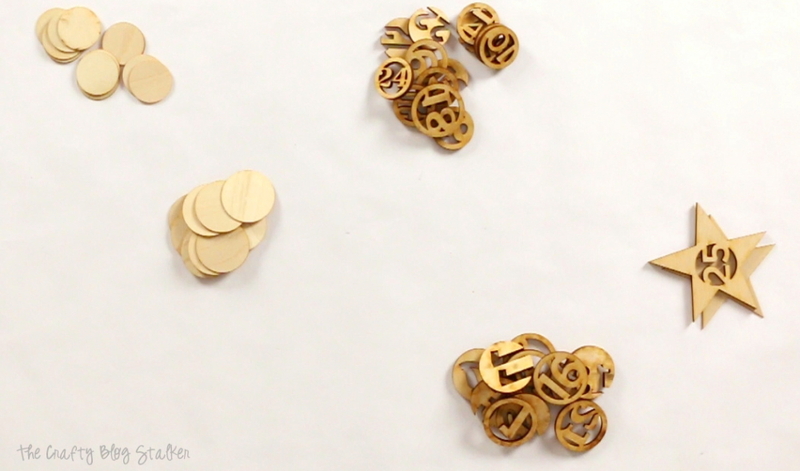 You will want to sort the pieces in two different ways. 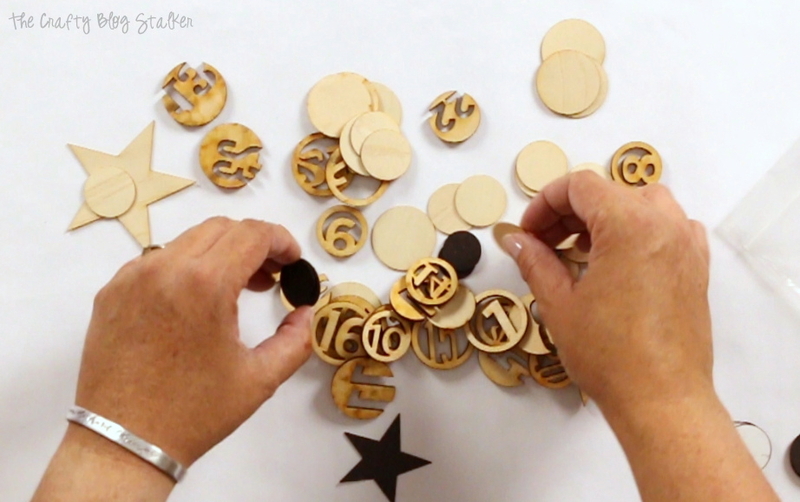 Sort pieces by size, there are small circles and large circles including that solid wood backs, and the star topper. Then, sort all pieces into 3 equal piles for the different paint colors, so you will paint some small and some large for each color. To paint, I have found it easiest to lay a piece of tape on top of my covered table with the sticky side up. That way the tape holds each piece so I don’t have too. This makes painting go much quicker and I don’t get paint all over my fingers. 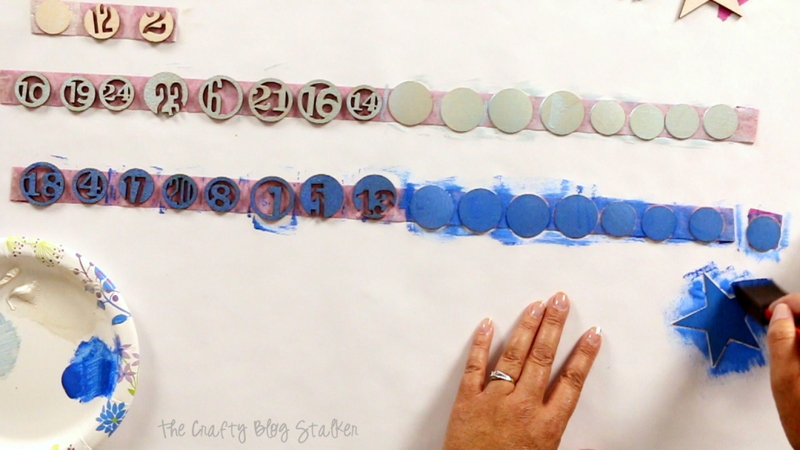 Lay down a strip of paint for each color to help keep the colors and pieces separate. Tip – Make sure when sticking the number to the tape that the right side is up so the numbers are facing the right direction. 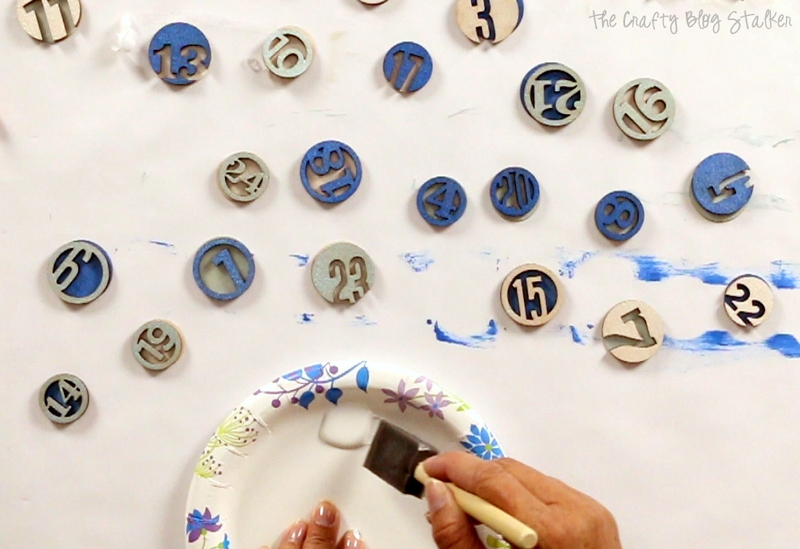 Pour a little bit of the paint onto a paper plate to use as a pallet and begin painting. I prefer to paint light to dark, so the top row was white from the kit, the next was light blue and the last was a darker blue from the paint I purchased separately. 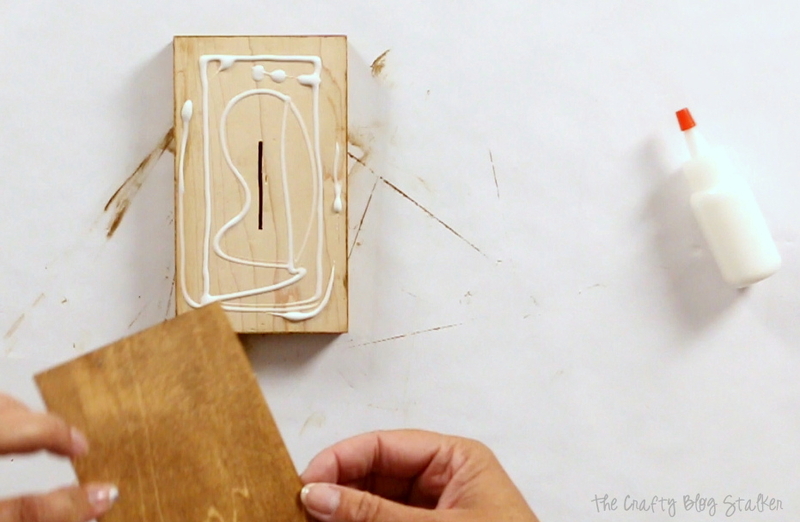 Let these pieces dry thoroughly and then simply peel from the tape. The next step is to glue the number fronts to the solid circle backs. Before you glue, go through and match up the fronts to different color backs. 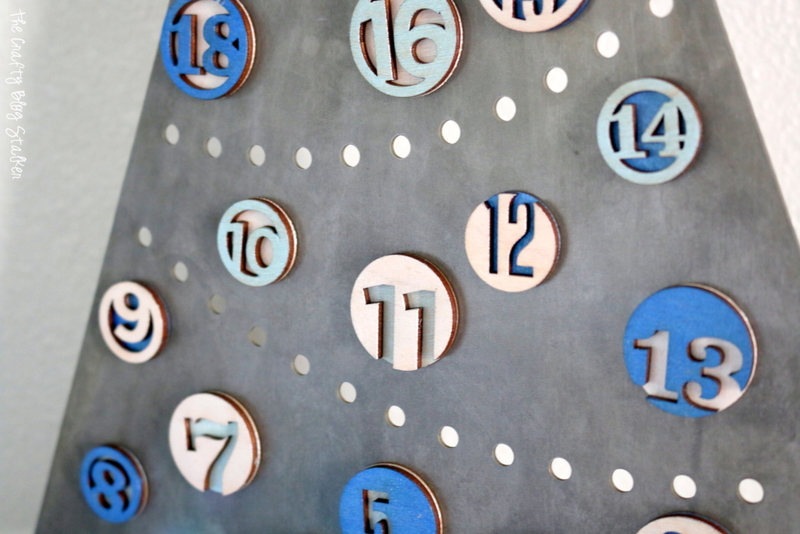 It would be a pain to get to the last couple numbers and see that they will have the same color as back, so it pays to do a little pre-planning. 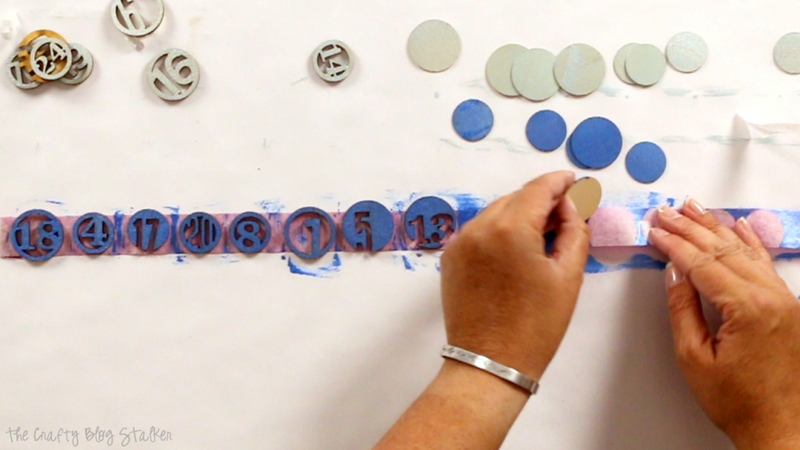 Apply the glue to the back of the numbers with the foam brush. Since these pieces are delicate with openings in the center you don’t want extra glue squeezing out that is hard to remove. Glue the magnets onto the back with a dot of glue. Slide the metal tree into the wood base and you are finished! If you would like you can glue the tree into the base, but I like that the tree easily slips out so I can store the tree easily during the rest of the year. So you have a comparison, the blue and white tree on the left is my version. The Red, green, and white on the right, is with the paints included in the kit. I think they are both super cute and no matter what color you made, your tree it is going to be awesome! 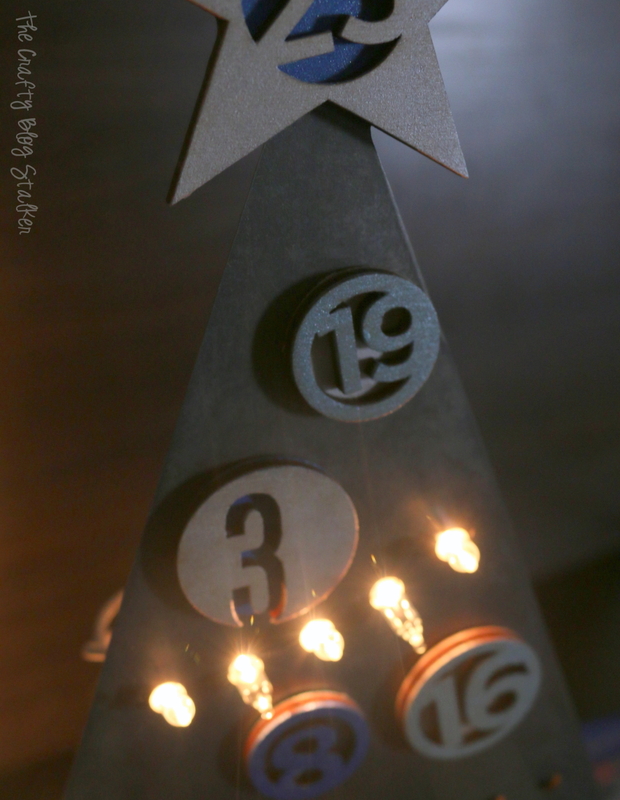 The whole look of this Christmas Tree Countdown is quite beautiful. Plus, it is really sturdy so I don’t have to worry about pieces getting broken from year to year. The holes in the tree are also the perfect size to insert an actual string of lights! You would need to find a way to secure the lights to the back, but it totally works! Next quest, what to do with the pieces when it isn’t time to add them to the tree yet? 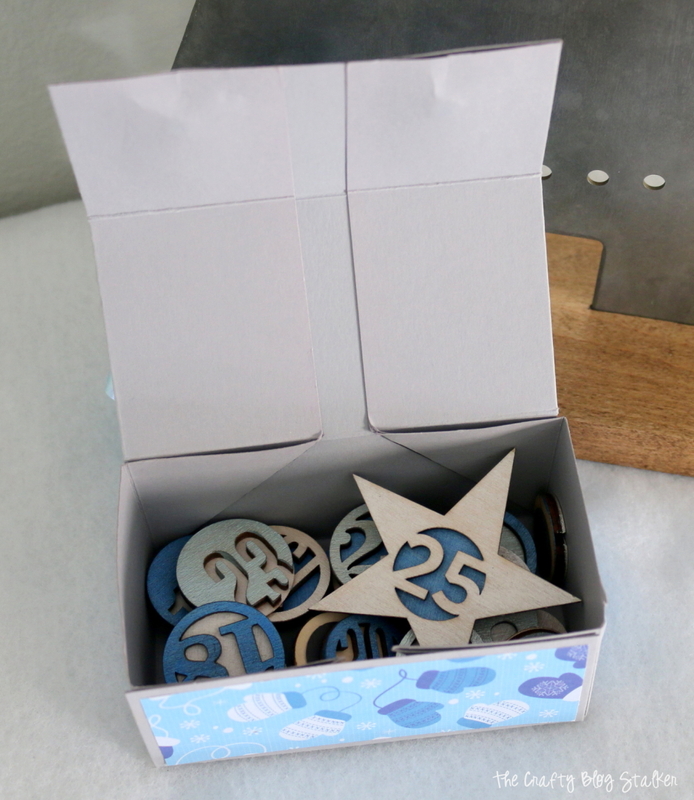 I created this simple paper box out of one sheet of 8.5″ x 11″ of cardstock that easily holds the extra ornament numbers while they are waiting to be added to the tree. Best part, it tucks right under the tree like a Christmas present! The box even has a magnetic closer so if it is knocked down the pieces should stay secure inside. Tutorial coming soon for the box! What colors do you use to decorate for Christmas? Share and leave a comment below. What a great idea! I’m focusing on Halloween and you’re on to Christmas! Thanks so much for sharing at Funtastic Friday. Ha ha! I know! It’s crazy, Christmas will be here before you know it! Thanks Sherry. Awesome paint job! 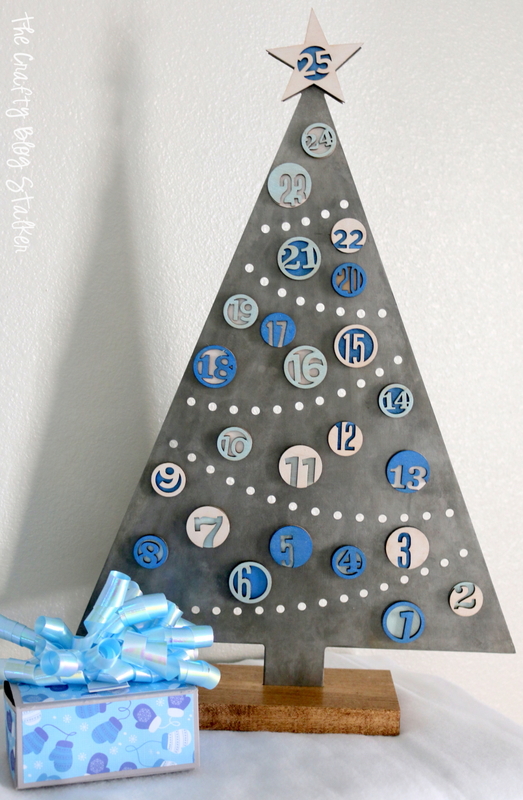 Love all your photos and these advent calendars are perfect for Christmas!!! Thank you so much Michelle! It is a really fun craft.